One of the strange things about writing a cookbook is wondering where my recipes will end up. I don’t necessarily mean the tables that they’ll grace or mouths that they’ll feed – although I’m completely fascinated by that too – but the way in which people will interpret what I’ve written, reinventing their very own versions of the flavours I eat and enjoy. A good cookbook should, of course be accurate, unambiguous in its instruction as to how to recreate the author’s recipes. But a great cookbook – in my eyes anyway – is one that also inspires a little experimentation around the edges. I read somewhere once that we class a cookbook purchase as a success if there’s one trusted recipe we end up making time and again. That sounds slightly mad, but rings true for the several cookbooks from which I’ve made only a couple of recipes to the letter, the rest acting as happy inspiration for endless meals and memories made. This weekend just gone is the first chance I’ve had to bake anything that isn’t from my book and I threw myself head first into Fanny Zanotti’s Paris Pastry Club. Fanny’s dreamy blog is a constant source of inspiration and her book is every bit as beautiful. 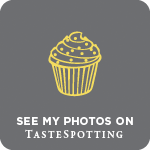 Whimsical words combine with stunning photography and recipes which range from a single serving tiramisu – which I know I’ll be making next time my husband is away – to more complex, restaurant-style desserts with lots of different elements. After a batch of the ‘Better than brownies cookies’ (a punchy claim, but I’ll admit that, warm from the oven, they come pretty close) I was drawn to the sunshine kissed photo of ‘Iced yoghurt with mead-baked peach’. 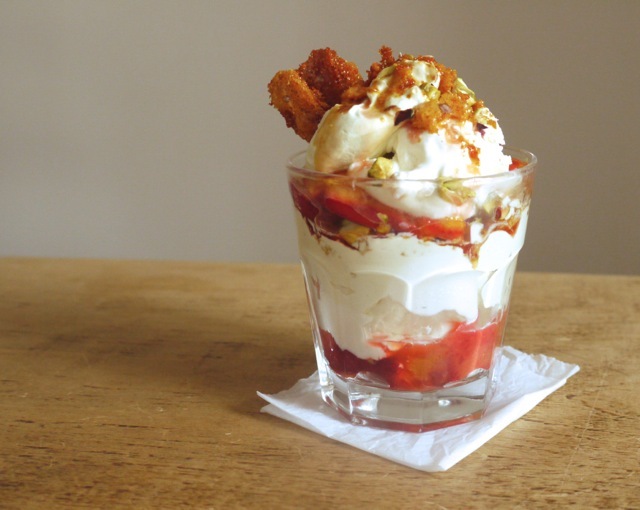 Not having any metal rings, or mead, or the inclination to make nougat when the sun was shining outside, I decided to loosely adapt Fanny’s concept to create more of a sundae – something that could be eaten on a rug in the garden, in my bikini, with a spoon. 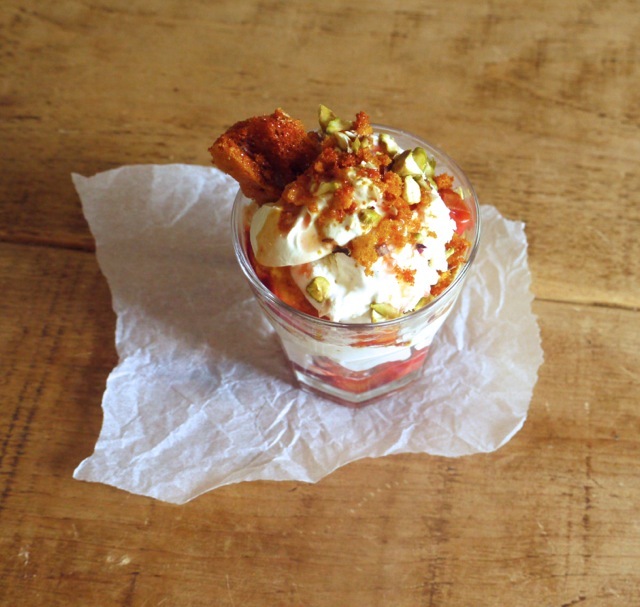 This sundae consists of layers of iced yoghurt mousse, syrupy roast peaches and pistachio whipped cream. Homemade honeycomb snuggled between the creamy layers dissolves into a syrupy sauce of sorts while the sprinkle on top adds a crunchy texture contrast. It might be a world away from what this author originally intended, but I’m more than happy with my creation: a lovely, summery dessert and recipe inspiration at its best. To make the iced yoghurt, heat the sugar and water in a saucepan over a medium heat until it reaches 118 degrees C on a thermometer. Meanwhile, whisk the egg whites until soft peaks form. Once the sugar syrup reaches temperature, remove from the heat and slowly pour in a steady stream into the egg whites, whisking slowly. Turn the speed up to high and whisk until the bowl feels just gently warm to the touch. Whisk the yoghurt in a large bowl to loosen it, then fold in the meringue. Whip 250ml cream to soft peaks then fold in until combined. Transfer to a 1 litre loaf tin or other freezeable container and freeze at least 5 hours or overnight. 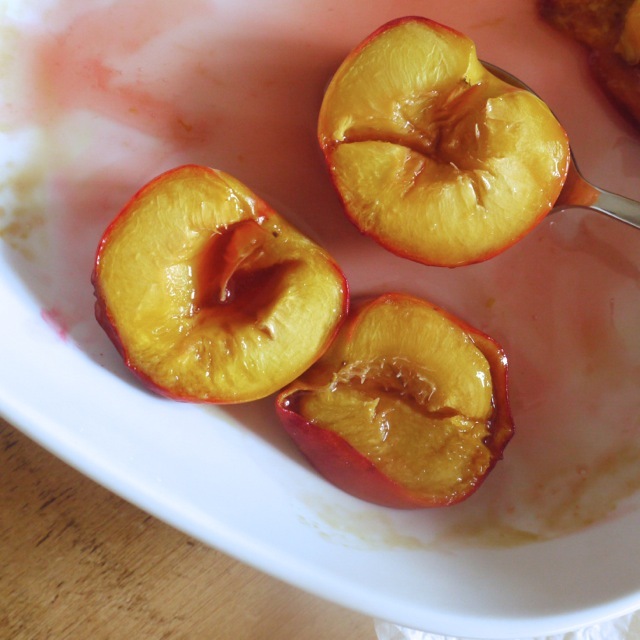 To roast the peaches, preheat the oven to 160 degrees C. Arrange the peaches, cut side up, in a roasting dish, and drizzle over the honey and Amaretto. Sprinkle with the demerara sugar then roast for about 20 minutes, spooning the juices over the fruit every few minutes, until soft. Leave to cool completely then cut each half into four pieces. Ten minutes before serving, take the iced yoghurt out the freezer to soften. Whip the remaining 150ml cream with the pistachio paste and honey. 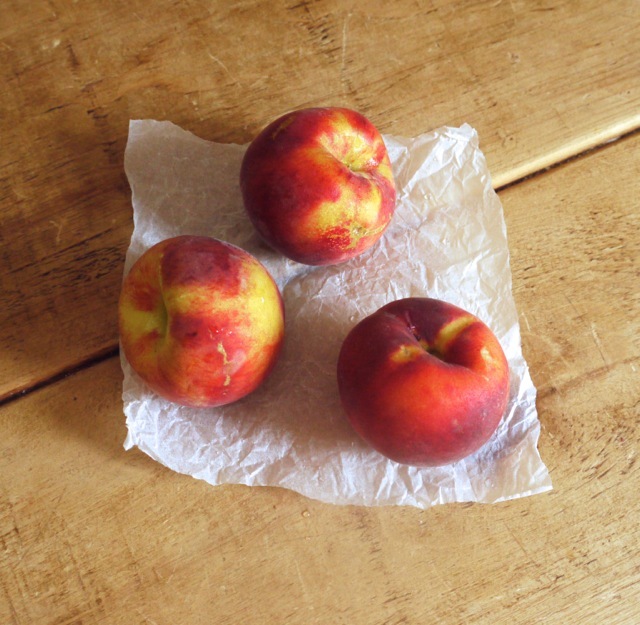 Arrange a few peach slices in the bottom of six glasses or sundae dishes. 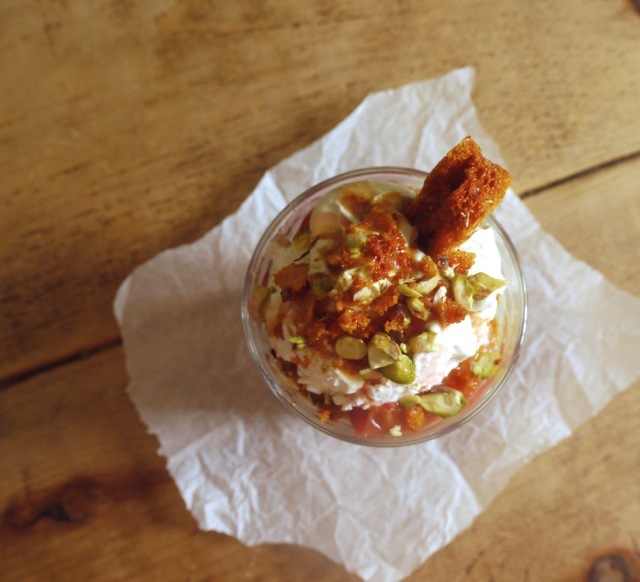 Top each with a scoop of ice cream, a dollop of whipped cream, a sprinkle of honeycomb and pistachios. Repeat, finishing with a few larger pieces of honeycomb. Serve immediately. I can only echo Emma’s comment above! Wow, that does look rather good! this is the kind of virtual dispatch that should be on my table in reality! it looks lovely! Oh this looks divine!!! I can’t wait for peach season here in Australia. And I totally agree with you that a cookbook should inspire. There are so many cookbooks in my collection that inspire, yet I’ve only cooked one or two recipes from them. I can’t wait for the release of your beautiful book. Any ideas on whether it will make its way to Australia? Wow what a gorgeous looking dessert! So impressive to serve guests for a dinner party. Oh gosh, this sounds so dreamy. As if syrup-y roasted peaches and pistachio whipped cream weren’t enough – you’ve added a massive chunk of honeycomb. Heavenly. wait wait wait – meringue and whipped cream into yoghurt for ice cream? and then roasted peaches? eaten in the sun? perfect! Hope the book is going well! This sounds like just the thing to end a meal with on a warm summer night. Looks delicious and perfect for summer! I will have to hunt out a copy of Paris Pastry Club that sounds like a book I will enjoy! You must! It’s such a wonderful book. It looks beyond amazing! I could dig into this right now!. I’m playing some serious catch-up on blogs, and this dessert is truly a stunner. I agree 100% with your assessment of a good cookbook, and I know that yours will fall into that category. As I wait for yours, I’ll take inspiration from this for a beautiful warm-weather dessert! I am so excited about your cook book coming out I bet it will be beautiful! This dessert looks delicious, perfect for sunny days!